The first time I spent my own money on fine dining was in August of 1980. My girlfriend was visiting on her birthday weekend and I wanted to do something special for her. Somehow I managed to score a reservation for two in the Crystal Room at Tavern on the Green in Central Park on the weekend of the Democratic National Convention (Carter and Mondale, but I voted for Anderson – remember him?). I had it all planned out; it was going to be a huge surprise. We took a train to the city, then a cab to the park. I gave the cabbie the address of the restaurant rather than the name so as not to spoil the big reveal when we arrived. We pulled up to the front, I paid the cab, and my girlfriend said “What’s Tavern on the Green?” So much for surprises. The staff immediately made us as a bunch of kids who could be hustled out of the room as quickly as possible to turn the table for a better tipping high-rolling politician. We were seated facing away from the view over the park, our waiter was brusque to the point of being rude, but I was determined to get my money’s worth, choosing to take my time eating. The only thing I remember about the food was that I had duck, a classic presentation of crispy leg and seared sliced breast. I don’t know how well it was prepared, having to standard of comparison, but I loved the taste. From that point on you could win bets predicting that I’d choose the duck entrée at any restaurant that served it. I finally laid that obsession to rest after my lunch at Bouchon, content in the knowledge that I’d eaten the Platonic ideal caneton á l’orange. 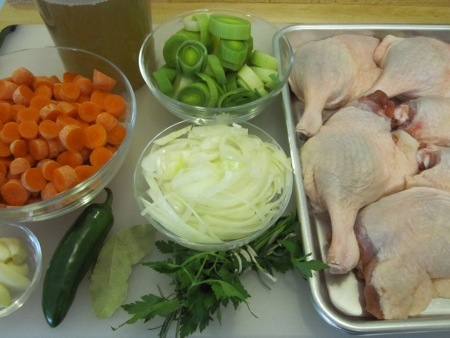 I assembled the duck legs, a peeled and sliced onion, two sliced leeks, 14 medium carrots (chopped into quarter-inch rounds), 8 cloves of peeled garlic, a parsley and rosemary bundle, one jalapeño pepper, two bay leaves, and about two cups of chicken-leek stock. 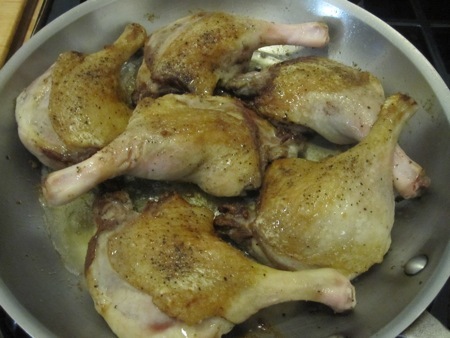 I browned the legs on both sides in a tablespoon of duck fat. 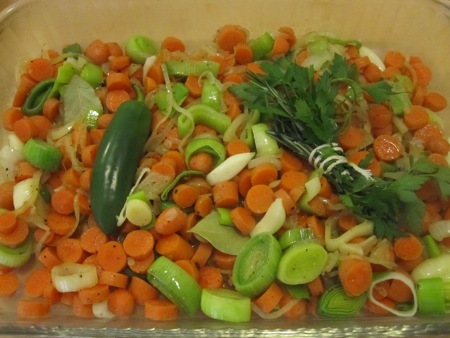 After setting the legs aside, I cooked the onions, leeks, garlic, and carrots in the rendered fat, then transferred them to a baking dish, adding the jalapeño and herb bundle. 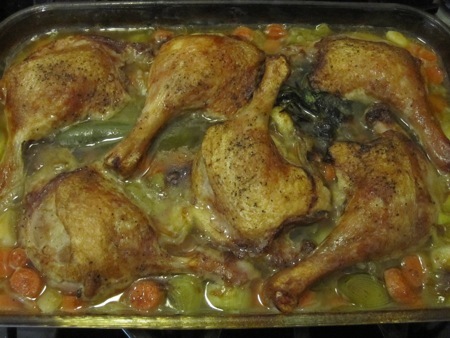 I set the legs on top of the aromatics, then added enough stock to partially cover the legs. After an hour and a half in a 375°F oven the legs were done. I set the legs aside, strained the stock from the vegetables (which I also set aside), and reduced the stock a bit to concentrate it. 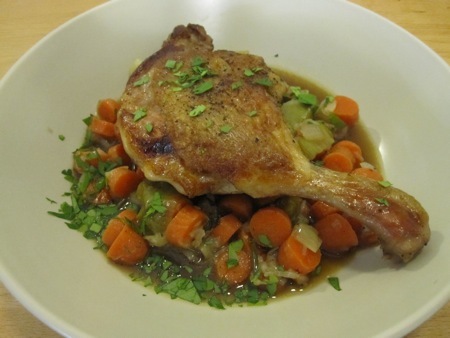 I plated the leg over the vegetables and added a few spoonfuls of the sauce and some parsley to garnish. Who am I to argue? It seems I’m dealing with a case of like father, like son, with He Who asking for duck for dinner. 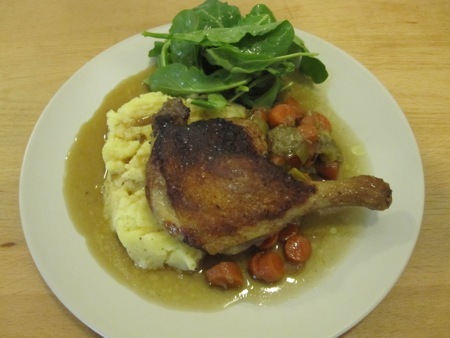 That’s what leftovers are for, and he happily ate this variation served over mashed potatoes with a side of arugula in duck confit jelly vinaigrette. Duck confit jelly? Yup, a by-product of a second duck project. But that’s another post.